I've always liked everything vintage and old and I love to wonder how the world was back then. The thought of starting to collect old postcards have been on my mind for the longest time, and finally I started my own 'old postcards' -collection some time ago! I have only few post cards so far, but I'm expanding my collection whenever I have the money and time to do so! The first four cards in my collection! 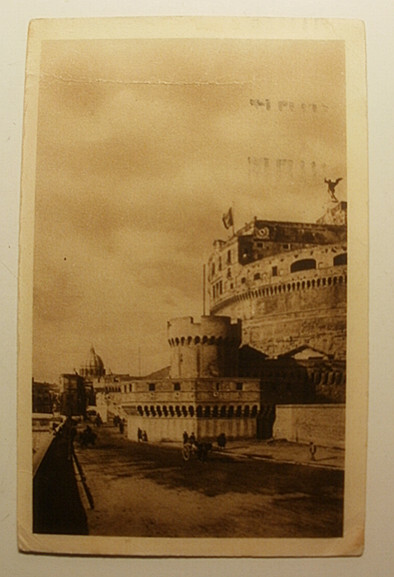 The second card is a photo of a castle in Germany. Under the picture reads "Soesl -- Wiesenkirche". The card was sent from Germany to Finland but I' not 100% sure about the year. Something about 1923? In the postal stamp reads '-9.1.23.7-8N'. The third card is my favorite card! It's a beautiful picture of a noble (high-class) girl who's looking out of the window. The card is dated in 1904. I'm not sure where the card was sent to. I guess the text on the card is Swedish and it's again for someone's graduation. 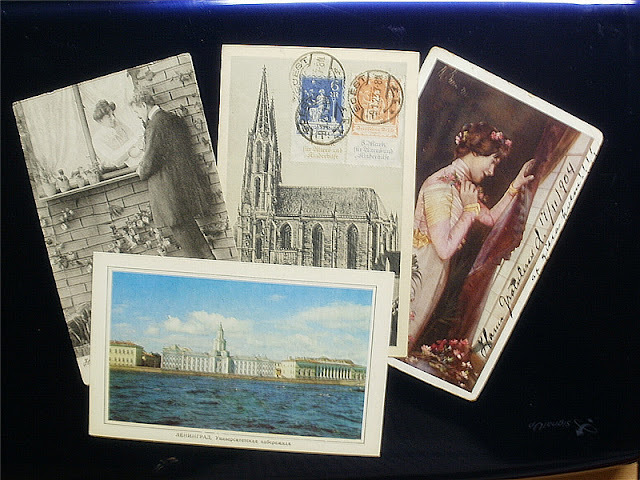 The fourth card is a a view of The University of Embankment in Leningrad. The card is unwritten and from 1970. 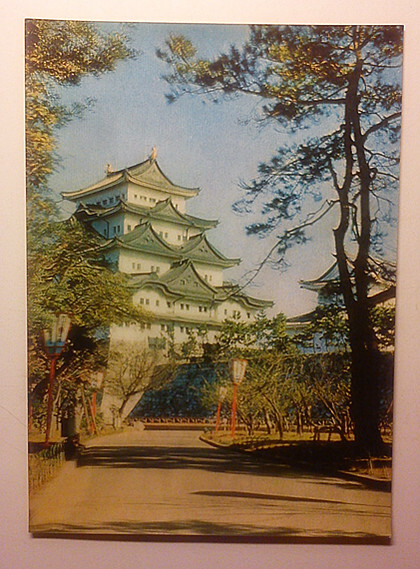 This is a 3D-card of NAGOYA-JO in Japan. It's unwritten and I guess the card is from about 1970~80 cuz it's 3D but the backside of the card is already yellowish. I bought the card because I was curious to see myself how the castle looks like in 3D haha! Of course it can't be seen on the picture above. The last one is a rather interesting card! 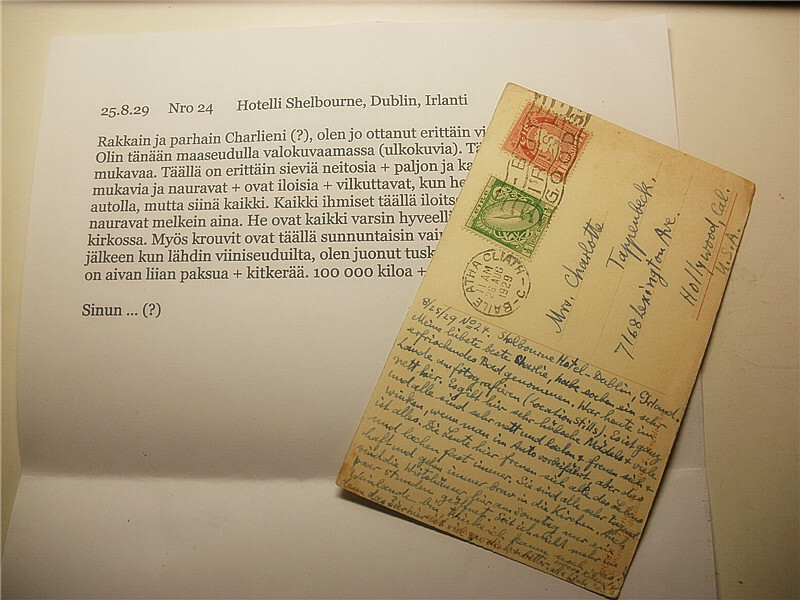 The card is dated in 1929, it's sent from Dublin, Ireland, to Hollywood, U.S.A. There is a message on the backside that is written in German! And now a Finnish girl is holding it (￣∀￣). The card is international for sure haha. Of course, I don't know any German so I asked if the German teacher of my high school could kindly translate the message for me, and she did! I was very happy and grateful for her hard work. I know it might have been a little hard for her to translate the card as it's written in old cursive and the text is very tiny. My dearest and best Charlie(? ), I've already taken a refreshing bath. Today I was photographing at the countryside. It's pretty nice here. Here's very pretty ladies + a lot, and everyone are very nice and laughing + they're happy + they wave at me when I ride past them on my car, but that's all. All the people here rejoice for life and laugh almost all the time. They're all pretty virtuous and they go to church. Also the taverns here are open only for few hours on Sundays. I have hardly drunk anything since I left the wine area/district(I don't know which world to use...) because the beer is too thick + bitter here. 100,000 kilograms + all my love, your ______"
I think that the old postcards are an excellent way to learn more about the old times! I'm hosting three new swaps!